Samsung Electronics is readying an entrant to the increasingly important low-end of the mobile device market with the Galaxy Tab3 Lite, which is powered by a 1.2GHz dual-core processor. In 2014, the worldwide tablet market is forecast to grow 47 percent with lower average selling prices attracting new users, according to market researcher Gartner, and Samsung wants a piece of that pie with the Tab3 Lite. The company hasn't disclosed yet what the tablet will cost nor when it will ship, but the very basic specifications place it at the low-end of the market. The device runs Android 4.2 and is powered by a 1.2 GHz dual-core processor. It has a 7-inch screen with a 1024 by 600 pixel resolution and 2-megapixel rear camera. Buyers will be able to choose between 3G and Wi-Fi versions. On the software side, Samsung will load apps such as Dropbox, Polaris Office and Flipboard. The Wi-Fi version of the device weighs 310 grams and has a 3,600mAh battery, which will be enough to last for eight hours of video playback, according to Samsung. The competing Nexus 7 from Google and Asus weighs 290 grams and has a 3950 mAh battery. 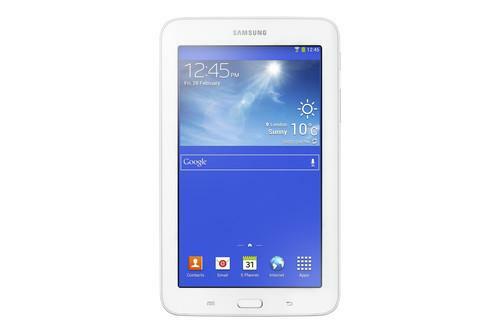 Samsung is also chasing the upper segment of the tablet market. At last week's International CES trade show in Las Vegas the company also announced the Galaxy NotePRO and TabPRO tablets, which have 12-inch high-resolution screens. Gartner expects sales of tablets to grow from about 180 million units in 2013 to 325 million in 2015.